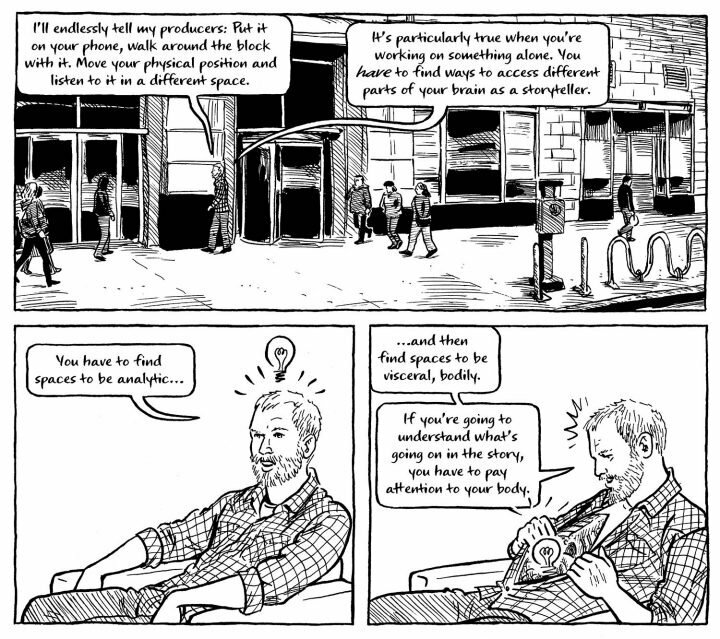 Intro from Jay Allison: We don't have a textbook at the Transom Workshops, but we think Jessica Abel's new comic book Out on the Wire: The Storytelling Secrets of the New Masters of Radio is about as close as we'll get. It's really a master class in radio storytelling - not a simplified, dummy's edition, but a deep examination of voice, story, sound, editing, collaboration and creativity - featuring many of the best producers working today. With pictures. Jessica has expanded on her book here at Transom, diving into the editing process a bit deeper in her Manifesto painfully titled, "Your Baby's Ugly." Back in February of 2012 I sat in — via Skype — on an edit at Snap Judgment, a character-driven show of intense first-person narrative. I was teaching that day, so I logged in from the library conference room at the School of Visual Arts. And I sat silently in that quiet room for over two hours — at which point, I had to get to class; they weren’t done — as the Snap staff methodically tore apart story after story, and then suggested new ways to put them back together. And when I say “tore them apart,” what I mean is that they — a group of about 8 people — listened intently to each story, and then tested it from every possible angle, looking for unclear transitions, missing information, clunky narration, bits of boringness. I had never seen anything like it. That’s an “edit.” And if you’re a producer of this kind of radio, the process will sound familiar to you. I’ve been thinking about that edit a lot lately. I’m not a trained audio producer. I’m a cartoonist, just getting into the game, really. 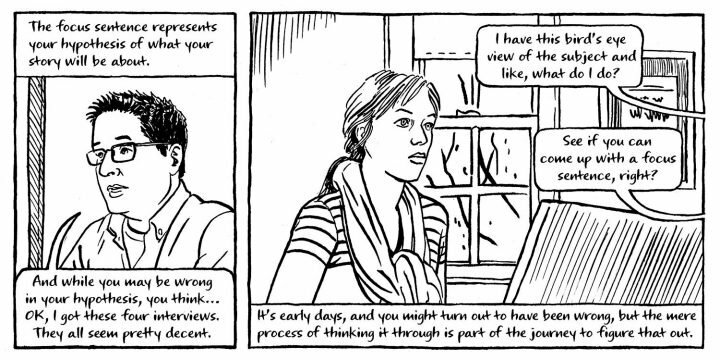 In my new documentary comic Out on the Wire: The Storytelling Secrets of the New Masters of Radio I talk to (and draw!) the best producers in radio, from Snap Judgment, Planet Money, Radiolab, This American Life, and tons of others. 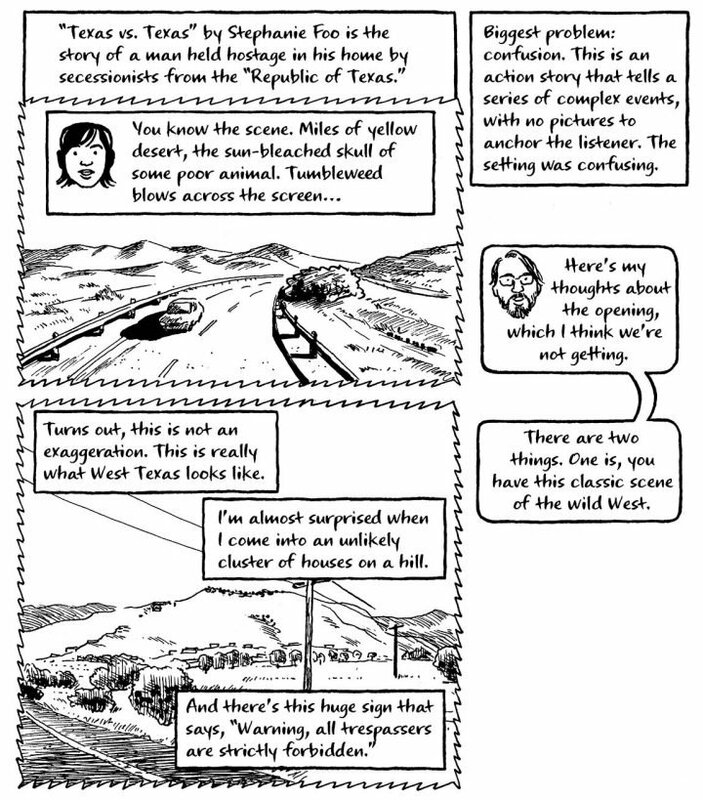 It springs out of a shorter comic I did with Ira Glass over 15 years ago called Radio: An Illustrated Guide, where I follow the production of an episode of This American Life from beginning to end. I don’t actually remember much about edits from my time all those years ago observing at This American Life, but I do know Ira and crew did an edit in front of me. They must have, because I drew all of three whole panels about it on page 17 of Radio. But what’s most important is what comes next, when Nancy takes off her headphones and helps Ira understand what it is he’s circling around in that scene he’s trying to write. I look back on those three panels now, and it’s crazy, because now I recognize that critique and collaboration are the magic pixie dust that allows my stories to exist. It’s what makes my stories as good as they are. It’s what makes This American Life, and Snap Judgment and all the rest as good as they are. And it took me ten years to figure that out. This is how I came around. When I drew Radio: An Illustrated Guide, I was living in Mexico City. I moved there with Matt Madden, who is now my husband of 15 years. But back then, in 1998, Matt and I had basically just met. In the mid-90s, we were both part of a large network of minicomics authors who traded comics and letters via the US Post, and Matt and I had been in lackadaisical correspondence with one another for several years. But in late 1996, early 1997, that acquaintance morphed into an email romance, and then Matt (who lived in Austin) flew to meet me in person in Chicago in March of 1997. In May, we visited Mexico with an eye to moving there together. In September, Matt moved to Chicago to live with me. And in March 1998, one year after we met, we were in Mexico City. So as I began work on Radio: An Illustrated Guide in the fall of 1998, Matt and I were still really just getting used to each other. And not only as people. Matt is a cartoonist too, and we were figuring out what it meant to work in the same field, and have many of the same reference points, as the person you love and spend basically all your time with. Mostly, it was fantastic. At last, I could talk as deeply and broadly with someone about comics in general, and my work specifically, as I wanted. I had never had that, even in a friend. But there were sticking points. Centrally, I had not figured out how to come up with stories, how to know what was wrong with them once I had something written, how to move my work forward. I spent a lot of time lying on my studio rug, just waiting, hoping that the fog would clear. But every time I worked out one story, and felt the sun shining, the fog would roll in again, and there I’d be, on the rug. I desperately, desperately wanted to be able to talk about ideas, to work them out in conversation. But Matt seemed bored, and maybe even a bit annoyed, by this kind of talk. One night, when I was deep in the dark forest of some creative crisis or another, we went out to eat. We had a sentimental favorite — not the most gourmet, or the most Mexican restaurant in town, not by a long shot. But it was a place we’d stumbled upon on our first, confused and confusing trip to Mexico City, in a now-famous neighborhood called La Condesa, which is quiet and tree lined, in stark contrast to the noisy, densely populated Centro, where we were staying on that first visit, in a cheap hotel behind a dance club. They also offered actual vegetables, unlike most of the taquerias we ate in on that trip, not having any clue how to eat safely without all our food ending up being basically fried meat. It’s called La Crêperie de la Paix. I find this doubly funny, now that I’m here living in France, and the only restaurant in which my kids are sure to actually eat their dinner is a crêperie. Anyway. We never ate crêpes there. We ate fried zucchini and cheese fondue. We ate that the first time, and we ate that every time we went back. So it’s a pretty good bet that that’s what we were eating when I had my “talk” with Matt. I explained to him, on the point of tears, that I just really needed to be able to talk about my stories, and I needed him to listen. It was awkward. Matt didn’t want me to be upset, obviously, but the kind of help I was asking for made him uncomfortable. He preferred to work solo, almost secretly, until a work was close to done. He felt that if he talked about a story too early, it would somehow end up not really his; it would be sort of…cheating. I get it. I do. But I don’t buy it. Over time, Matt and I got better at talking through stories. I save it up for specific times. I make an “appointment” when I know we’ll have an hour or two free. Road trips are good, or restaurant lunches while the kids are at school. And a few years ago, inspired by the radio people I was interviewing, I started recording these talks. That has made a world of difference. Even Matt will talk about his work-in-progress sometimes these days. I also started teaching comics soon after we returned to the USA, at the School of Visual Arts. And that meant year after year of story critiques. Critiques of thumbnail layouts pinned up on the wall, discussed and dissected. Story pitch sessions with students trying to nail the gist of their story out loud to the class. Private story development meetings bent over a student’s desk. I got a lot of practice at this. So, back to Snap. You’d think, after This American Life in ‘99, and then 13 years of practice, this editorial collaboration thing would ring a bell. But no. It finally started to dawn on me when I began my research for Out on the Wire in earnest. When I hung up from my Skype call with Snap Judgment, I thought I’d stumbled on some new innovation. Not that no one else had group edits, but that Snap did more of them, with more people in the room…well, okay. That might actually be true. I compared the meeting to an MFA writing seminar, only a lot faster and more brutal. And more specific. And more actionable. I pushed to find out who had “come up with” the way they work…and Mark Ristich, the executive producer at Snap, said it just evolved naturally out of him and Glynn being good friends who could talk honestly about (i.e. rip apart) each others’ stories without destroying their friendship. I saw something completely different at my next stop on the research train. I visited the Transom Story Workshop, where I sat in on a long class session where four students discussed their stories. 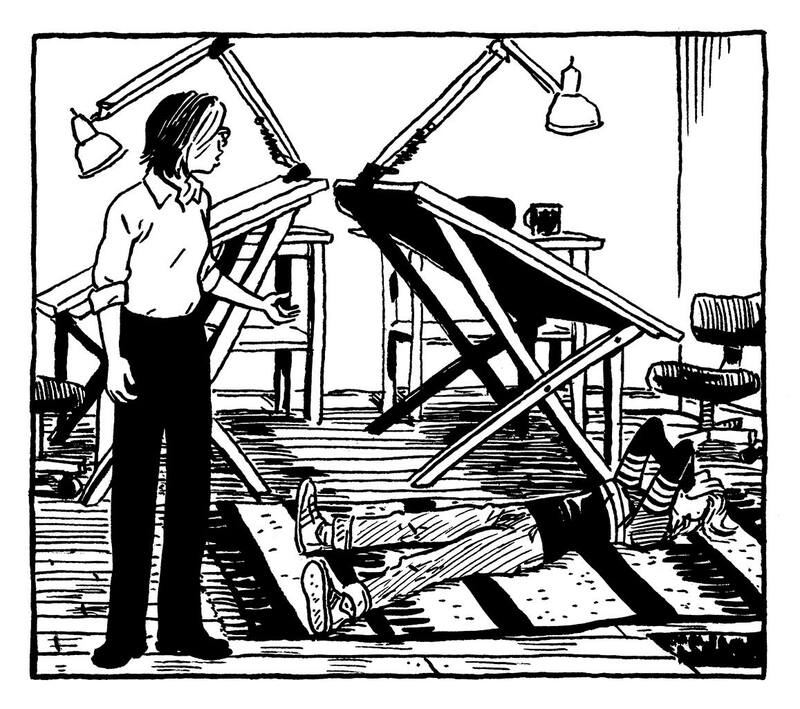 Rob Rosenthal, the teacher, has this fascinating style, where he pokes at something, and then just lets it ride until things click into place for the students, and they discover for themselves what Rob was hinting at. As a teacher, I was in awe of his patience and fortitude. It’s hella hard for me to allow that much dead air to exist. And I’m not even in radio! Rob calls it “Just In Time Learning.” Like, you get what you need, just as you are actually going to use it. And it worked. The students — Lauren Ober, Jessica Kittams, Jenna Weiss-Berman, and Andrew Norton — were so sharp. They heard everything, and offered extremely actionable feedback. It made my job of portraying what took place in the class in comics form in Out on the Wire basically impossible, because only Rob summed up ideas in a way efficient enough for comics-length word balloons. Still, as these new producers thought through their narrative problems and came up with the answers on their own, I could see the process clicking for them. They were becoming the effective, supportive colleagues everyone wants, right in front of my eyes. Again and again I saw the value of collaboration. I visited Planet Money. They would cram 5-8 people into one tiny office, sitting on the windowsill and floor, to do an edit of their shows. Sean Cole walked me through the edit process at Radiolab, with iteration after iteration of virtually finished, soundtracked stories being pulled apart and remade over and over again. Ira told me that the process at This American Life has evolved to the point where every producer is sitting in a room, all on laptops logged into Google Docs, furiously editing the script simultaneously. The edit is so consuming, so intense, so hard. And so, so helpful. The work that comes out the other side of this crucible is the best storytelling we’ve got. Why had I never seen this kind of thing in action before? What do radio people know that the rest of us are missing? Hang around Transom and find out. The fact that radio is audio, and that therefore producers necessarily have to read/say their stories out loud at some point already puts them at an advantage over other narrative forms. Just plain saying your stuff out loud, to someone else. It’s such a basic, almost dumb idea, but it’s kind of magic. At the conceptual stage, you can hear if your idea rings false in your ears. You can see what happens on your listener’s face (of course, you have to learn to pay attention). And I find that speaking my ideas out loud, and then feeling an awkward (let’s call it Rosenthalian) pause gets my brain revving, looking for what is missing. At the writing stage, you can hear if your dialogue sounds like something a person would actually say. You can feel when you trip over your sentence structures, possibly because they don’t make sense. And that’s not even counting what the other person might say. So the basic setup of radio edits, even the simplest ones, with one editor, over the phone, already have built in advantages. But we can all learn from this process. There’s the pitch meeting, where you have to formulate your ideas, articulate, them, and defend them. Why this? Why now? There’s the reporting process, where, on a show like Planet Money, more than one reporter may be working on a story, and be interviewing simultaneously. At the very least, you’ve got a reporter and a producer working together, brainstorming, taking note of what is working, when the good tape happens. There’s the writing process. Solitary for some, almost disturbingly collaborative for a show like Radiolab. And finally, there’s the formal edit — of the written script and tape cuts, or even final edited, soundtracked piece — with anywhere from one to ten people chiming in. And that stage can be repeated many times — four or five for the Snap Judgment stories I followed. Think about it — if you’re writing alone in your cave, you’ve got none of these. Not even the pitch meeting. Sure, if you’re a published writer, you have to write pitches, but the back-and-forth development with the editor is rare. 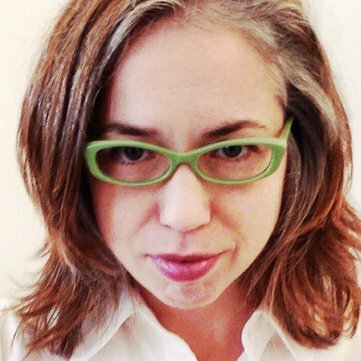 If you’re lucky, you’ll get to the final stage and have a great editor (like I did on Out on the Wire — Meagan Stacey Levinson) who will put in the hours combing through the draft and talking out the possibilities. But that kind of commitment from an editor is also rare (not always their fault, I should add — editors these days have a lot on their plates). But in the middle of the process? Not so much collaboration happening. And this is perhaps where it’s most useful. What’s going on in those talk-it-out brainstorming sessions? First of all, there’s the tape-loop-interrupter factor. You’re telling yourself all kinds of things about what you need to write, which characters need to do what, not to mention that you’re a crap writer and will never be able to do anything worth reading/listening to. Someone else listening can easily see through all that, if you can just hear them. Following on that idea: you’re too deep in your own story. You know exactly who used to be a gangster but is now clean, and why. What happened last year at the mill. Which new zoning law forced which family to move. You know why you introduced us to this guy and what he means. We, the listeners/readers, do not know. And when we talk a story through with you, you’ll see the confusion bloom on our faces. We’ll be saying “wait, what?” and you know you’ve got to give us some more information and a clear signpost. And sometimes, you just forget why you liked your story in the first place. It all seems drab and like you’ll never give it that spark that it needs. But talk yourself back through it, and you’ll find the heart of it, the thing that made you begin so energetically back whenever that was. It feels really good to talk about an idea, and experience a breakthrough. That’s what makes it feel like cheating. Anything so easy and fun can’t be okay, can it? But let me assure you: Once you arrive at these new insights, you still have to do the work of implementing them. It’s still just you and the Bristol board, or the mic, or the computer. It’s just that now, you have a clarity on what to do next that would have taken you weeks to find on your own. Intense collaboration takes a toll. No one likes to hear that they didn’t get it right in the first place. But the process is so fast, and so productive, and produces such excellence I’m working on incorporating it into everything I do. Thanks for the tips, genius. Now what? Anyone who’s even a little bit brave can implement the pitch part, where we test our ideas on others, and on ourselves. It’s fairly simple to work collaboratively on writing. Simple, I say, not easy. Learning to let go and accept feedback, assess what that feedback really means, and then figure out how to grapple with it, that takes a ton of practice. Once the piece exists, prose writers have the advantage. 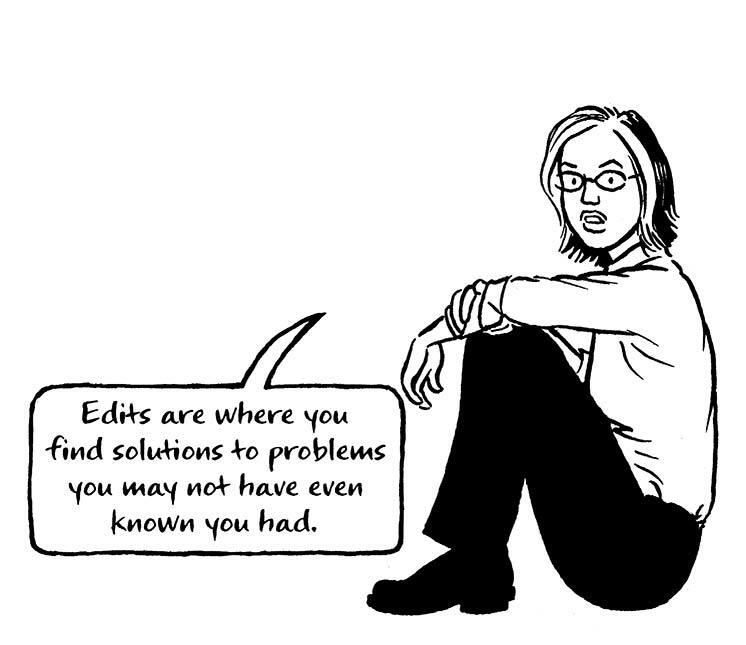 Editing prose is an art, and it can be hard both to give and to take edits. But comics are a tough medium to edit usefully. In order to have anything to talk about, traditionally you’ve got to do so much work on the art that you’re loathe to go back and change anything substantial. That’s why I developed the style of writing I used on Out on the Wire, where I write directly in page layouts using InDesign, using panels, so that I’m thinking visually as I write, and an editor can read about what I’ll be drawing without my going through and actually drawing everything first. So now, so many years after my tearful fried-zucchini talk with Matt in Mexico City, I am convinced: there is nothing cheat-y about using your mouth and your instincts to find a new angle on a story. Sure, there are different methods and approaches, but I believe that editing and collaboration are the heart of creative work. It makes the weak strong, and the good better. This idea of collaborative work is so inspiring to me, I’ve actually made it the basis of my newest project, a podcast based on the concepts from Out on the Wire. It’s a miniseries where I break down the ideas in the book into actionable steps, expand on each one, and then create challenges for listeners, where they work through their own narrative project. But to send people out on their own to struggle is contrary to the spirit of what I’ve learned over the many years of being a narrative artist myself. So I’m also creating an online space for collaborating, editing, critiquing, helping. I haven’t launched this yet, so I’m nervous. I don’t know if it will work. But I am absolutely sure I need to try. Join me? Cartoonist and writer Jessica Abel is the author of the graphic novel La Perdida (winner of the the 2002 “Best New Series” Harvey Award) as well as two collections of stories from her omnibus comic book Artbabe. She and her husband, the cartoonist Matt Madden, were series editors for The Best American Comics from 2007 to 2013 and teach at various institutions. Together they’ve authored two textbooks about making comics, Drawing Words & Writing Pictures and Mastering Comics. Jessica collaborated with Ira Glass on Radio: An Illustrated Guide, a non-fiction comic about how the radio show This American Life is made. Her new book (and podcast), Out on the Wire, is about how the best radio producers in the world use story to keep us listening. Jessica works with narrative artists with big ideas that have led them deep into overwhelming projects. Together, they create a map to guide them out of the forest and to a brighter, better, stronger story. Find Jessica’s free tool that will give you a new point of view on your writing here. Jessica lives in Brooklyn, New York, with her husband and their two children, but is currently on a residency at the Maison des Auteurs in Angoulême, France. Her latest science fiction comics series, Trish Trash: Rollergirl of Mars debuted in January 2015. I am 120 pages in and can’t put it down… the only thing that’s stopping me from completing is I don’t want to (so I keep going back and re-reading)! Every page is a combination of illumination, technique and invitation. I am committed to this movement and it’s because of gifts like these (Out on the Wire, Transom, etc.). This community and the ideals that undergird it make me more human. Thank you and bravo on the book Jessica! Robbi–You have a certain level of built-in editorial perspective in your partnership, I know, but adding a pro, who does not personally know you, to the mix brings it up to a whole new level. Can’t wait to see what you publish next! Ray, everyone has to start sometime. The important thing is just to start. Jessica, your book and this post and the communication and community you seem to be pursuing…well, they’re inspiring me, and I can’t wait to see what comes of it all. Thank you. Thanks, Philip! so nice to hear. Love this post. My wife and I also do the talk through all of our ideas on long car trips thing. And we listen to podcasts. Will subscribe to yours! Also need to check out this roller girls from Mars project.